Calibration can be tricky business. Especially when you get interesting scientific events occurring during the calibration process. 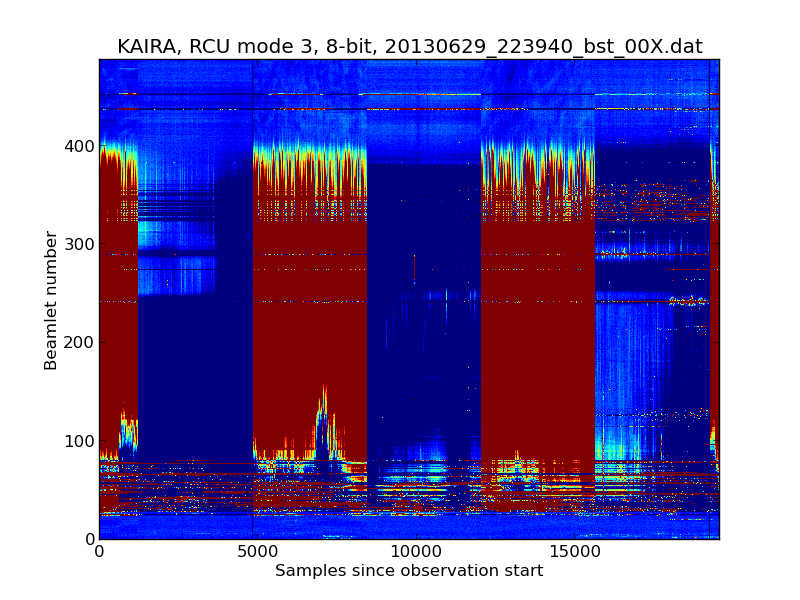 Recently, we were attempting to measure the on/off source fluxes to estimate KAIRA's sensitivity. Two problems crept in: ionospheric scintillation and ionospheric opacity. In the plot, the vertical axis is labelled "beamlet number", but it is linearly-proportional to frequency. The horizontal axis is time. Red is strong radio emission and blue is very weak. The two main blocks in the middle of the plot are Cygnus A and Cassiopeia A. 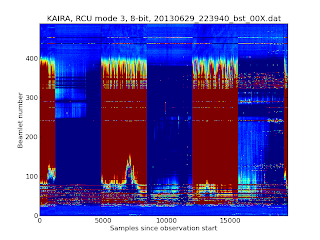 If you look at the top of them (around beamlets 320-400), you can see a "colourful fringe". This is ionospheric scintillation. We know about this and the solution is to time-average to smear it out. However at the lower frequencies (roughly beamlets 50-130) there are also some odd effects. In particular, around samples 7000-8000 there is a large drop in radio strength from Cygnus A. This is caused by increasing electron density in the ionosphere (around 80km up). In this plot it is pretty obvious, but it certainly caused us to puzzle over the rather odd results when we were trying to figure out why the Cygnus A measurements gave such completely different ones to the Cassiopeia A equivalent.